The Game Developers Conference sees much of the world’s game industry converge each March on San Francisco for a week of deals, demos, parties and talks. The event is full on and fun – I came back with a pocket full of business cards and 28 pages of notes – below are a few highlights. One of the most notable things was the first ever board games day – with speakers such as Matt Leacock and Rob Daviau, designers of the top-ranked board game on www.boardgamegeek.com , Pandemic Legacy, talking about pacing, story and gameplay in that game. I think the digital games industry has a lot to learn from what designers such as Matt and Rob have done with the creative constraints imposed by cardboard and plastic. I also think there is tremendous potential for mixed reality games where the digital meets the cardboard, but there aren’t any examples yet that I’ve found myself wanting to play. My first love in games research is in Artificial Intelligence (AI) so I went to plenty of talks in AI and Machine Learning (ML), including an excellent exposition of what deep learning is by Alex Champandard of aigamedev.com (pictured with your DC Labs Director drinking coffee at the best coffee house in San Francisco :). NVidia did many sponsored sessions and gave an interesting half-day workshop to deep learning, using data sets from handwritten character recognition. 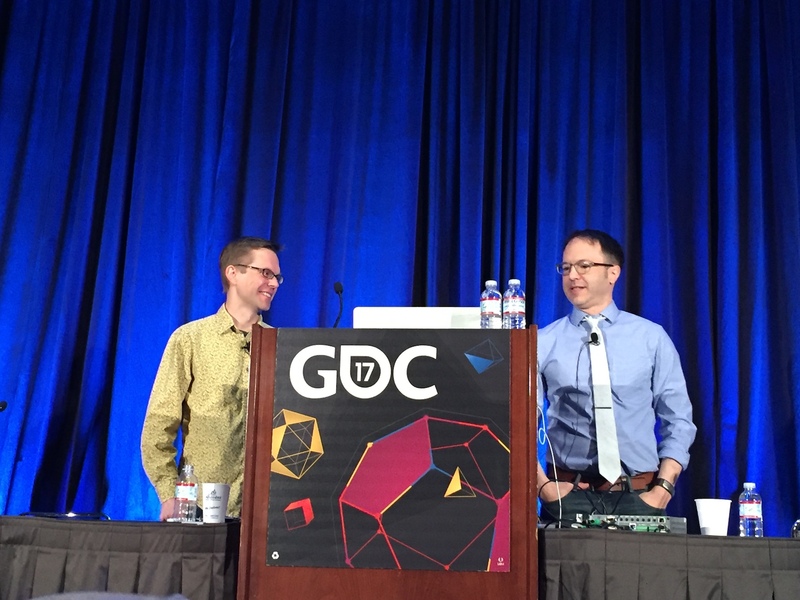 There seemed to be a lot of buzz at GDC at the possibilities of mixing ML and other techniques – our target in Dc Labs is to mix ML and Monte Carlo Tree Search (MCTS) – but that’s another blog… Also saw an excellent talk by Dave Churchill of U Newfoundland on using MCTS with a “hierarchy” of strategies for the commercial game Prismata and had a good chat with him about strategies to dig yourself out of several feet of snow in Newfoundland :). This was the first GDC that was matched up with the Virtual Reality Developers Conference (VRDC), so there were some fabulous demos alongside the games industry’s pragmatism on how to make money out of VR when there are so few headsets out there (with talks such as the memorably titled “Dear VR, Where's My Money?”). 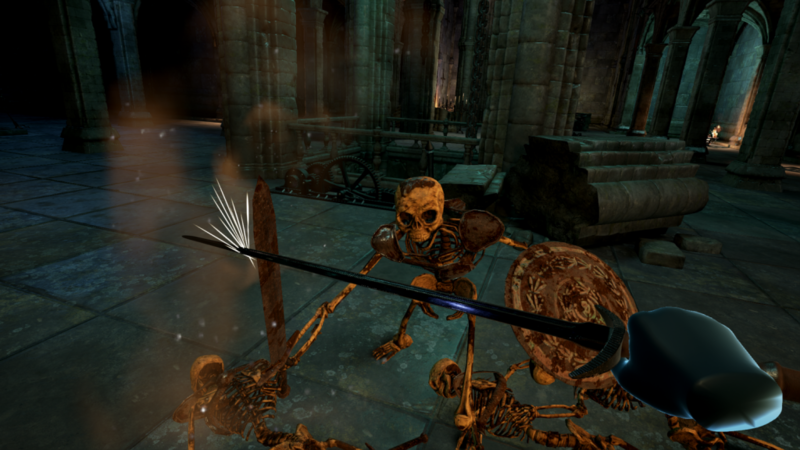 There are some fantastic examples out of what can be done – notably Yorkshire’s own Simon Barratt with “Raiders of Erda” – multiplayer VR from Cooperative Innovations (see picture). Much of my time is spent in Leadership nowadays – so it seemed like a good idea to see Jesse Schell’s talk about how to lead a studio. 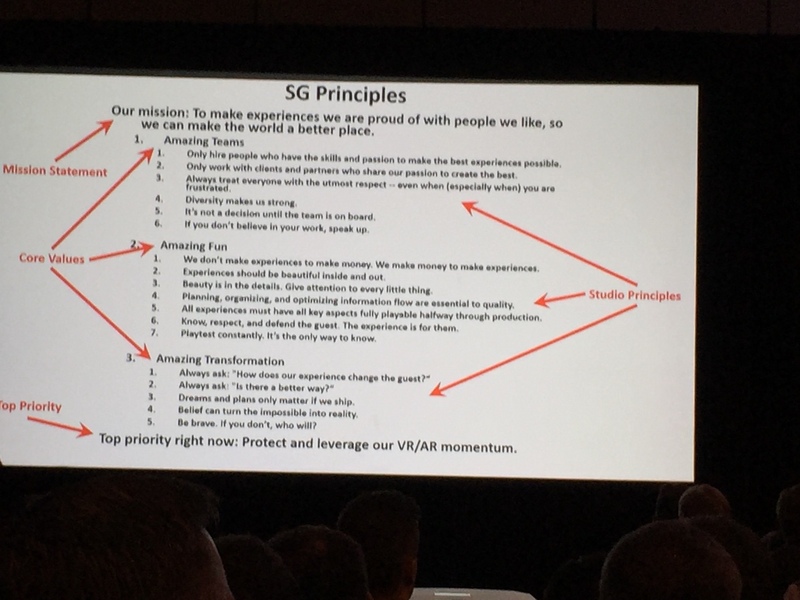 One of the ideas he talked about (and which we have talked about previously with Frank Boyd, the chair of our advisory board) is having a statement of principles (making more concrete the ideas: “have fun”, “work hard”, “be nice” and “do interesting stuff that people actually care about”. He was an awesome speaker who poured out distilled common sense while being very funny and engaging. 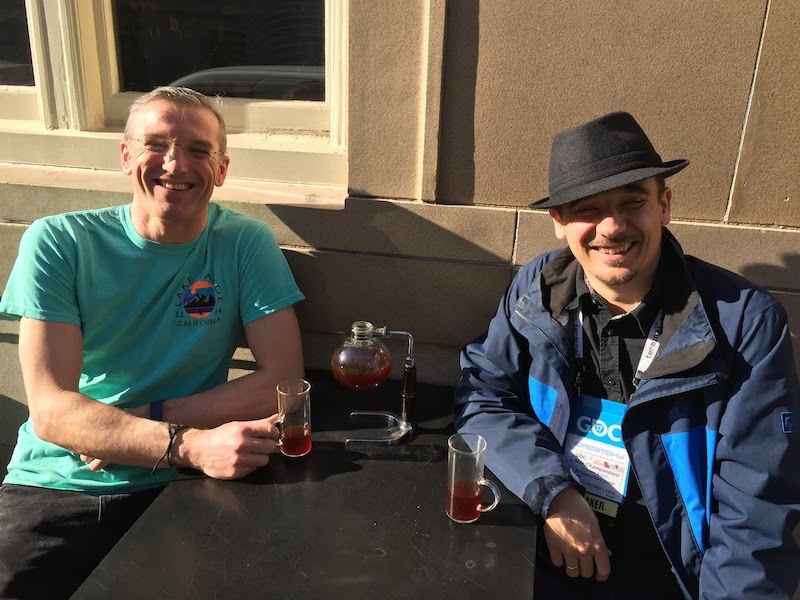 GDC is also an important place to catch up with friends and colleagues from around the world – as well as those from the UK (which is always very well represented at GDC). It was great to catch up with leading industry figures like Charles Cecil of Revolution Software (pictured with the Director and Manager of DC Labs). Reminder to self – be more careful in choosing passersby to take a photo :). I’m not sure I’m allowed to tell you what Revolution is up to – but it is awesome :). 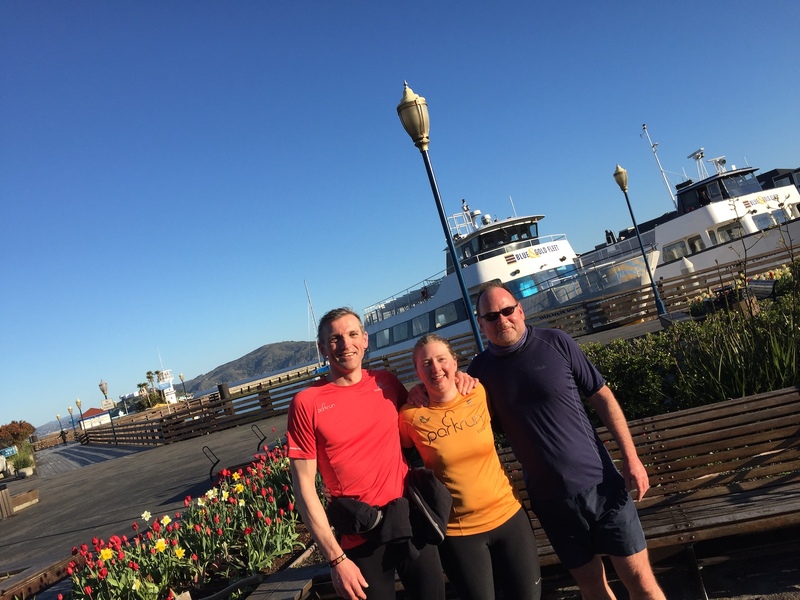 We also went on an annual cycling pilgrimage across the Golden Gate Bridge with Jeff Rollason of AI Factory Ltd., who continues to do fascinating things with Monte Carlo Tree Search in the freemium card/board games space. AI Factory is a great example that in order to be a major, innovative player in the mobile games space (well over 100 million downloads to date! ), you do not need massive budgets and big development staff. 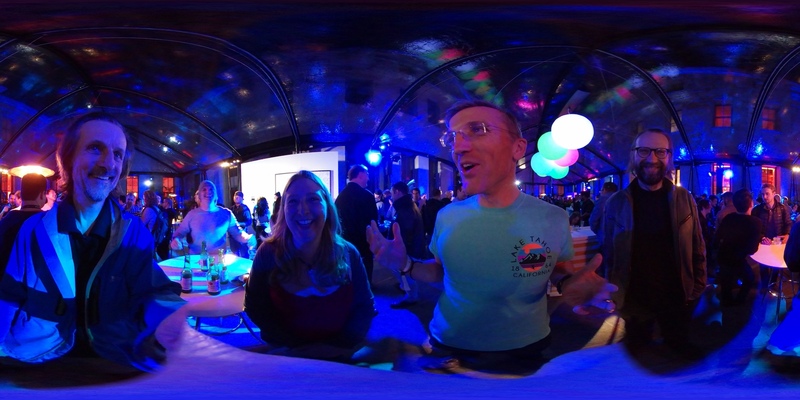 And there were some parties – most notably the lavish, if rather short, Google party (picture taken with Jeff's new 360 camera) where lots of Google’s product teams and partners were showing what can be done with their tech.